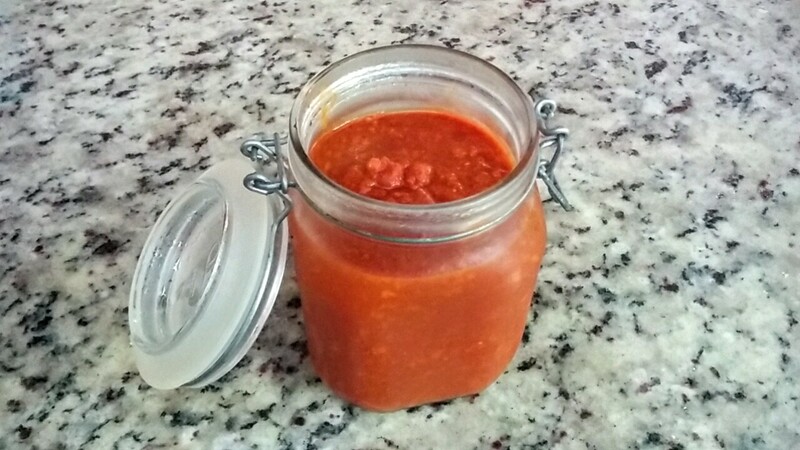 ... en la Cocina: Ghost Pepper Salsa... Smoking Hot! Ghost Pepper Salsa... Smoking Hot! John has this thing about growing chili peppers that are actually too hot to eat. Last year he was tremendously successful at growing Ghost Peppers. The bushes went dormant during our dry season, but now that is's raining again, the peppers are back with a vengeance. I picked up additional varieties of seeds for him when I was in Texas this past November. John now has lots of young pepper seedlings including Carolina Reapers, Hatch Red Chili, Hatch Green Chili, Big Jim Chili, and a couple of others. The Ghost Pepper, or bhut jolokia, is a hybrid chili pepper first cultivated in India. In 2007, Guinness World Records certified that the ghost pepper was the world's hottest chili pepper, 400 times hotter than Tabasco sauce. The ghost chili is rated at more than 1 million Scoville heat units. However, the ghost chili was shortly superseded by the Infinity chili in 2011, followed by the Naga Viper, the Trinidad moruga scorpion in 2012, and the Carolina Reaper on August 7, 2013. 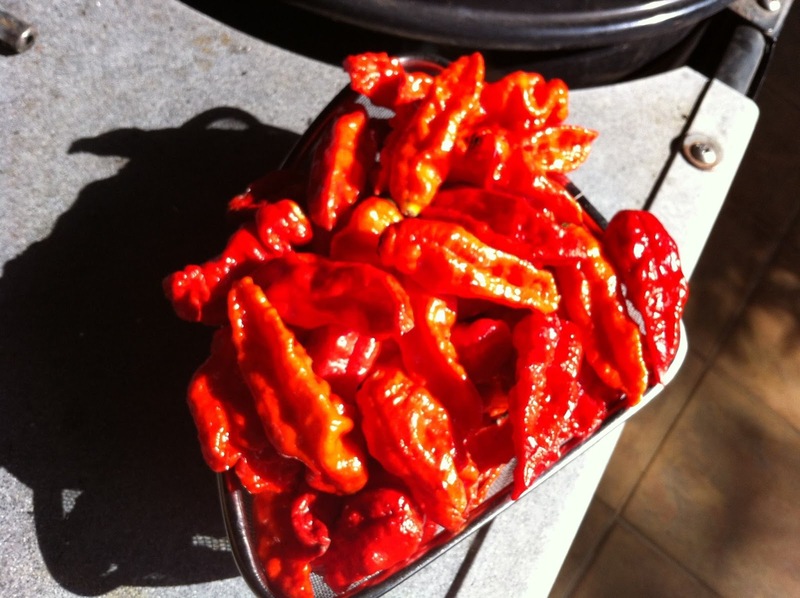 Last year, we smoked the batch of Ghost Peppers you see in photo, and then ground them into a fine powder. The powder is actually too hot for most folks to tolerate, including me. I finally came up with a salsa recipe for the peppers that is actually quite tasty. It is not for the feint of heart! I dare you to try this! Step 2: Open all the windows and turn on the fans, or you will be overcome by the peppers. Step 3: Put on a pair of gloves to protect your skin from the peppers. Step 4: Quickly process the peppers! Step 5: Quickly toss the peppers into the sauce pan and cover it. Once all the ingredients are in the saucepan, bring to a boil. Reduce heat to low and allow to simmer about 20-30 minutes to soften. Transfer contents to a food processor/blender and process until smooth. You may need to do this in batches because the hot liquid will expand in the food processor. Transfer to a container. Seal and allow to cool to room temperature. Refrigerate until ready to use. NOTE: The flavors will grow more intense the longer you wait. That's no joke about having a fan at your back, blowing the fumes away from your front. Even better, do the cutting of the raw peppers outdoors in a stiff breeze.